Yard takes his fascination with surface noise a step further on this new 12-inch. “Detrit” is a crunchy, crackling techno track with a slow-building melody. Somehow it evokes nostalgia of late-night radio shows with vinyl spinning in a darkened studio. “Squeekr” is a fun digression. Warped synth notes whine over a coarse bassline. It’s somewhat grating, but I’m reminded of old, primitive UK techno. The B side contains two remixes of the title track. The first, by Cane, injects acid squelches and deeper bass. The second, by Anders Ilar, has a dubby, aquatic undertow. It’s subtle and pleasant if a bit muddy. I actually like the original version best of all. 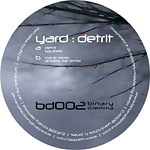 I wish Yard had provided four different tracks in that style.